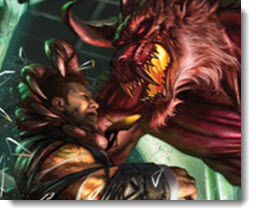 In this issue: a monster betrayed, a classic retold, and a stand for humanity’s freedom. All that plus an interview with Monster Hunter cover artist Alan Pollack and a new contest! Hell Hath No Fury Like a Monster Betrayed! Agent Franks of the U.S. Monster Control Bureau is a man of many parts—parts from other people, that is. He’s also nearly indestructible, animated by a powerful alchemical substance and inhabited by a super-intelligent spirit more ancient than humanity itself. Sworn to serve and protect the United States of America from all monsters, Franks has only one condition to the agreement: the government is never allowed to try and make more like him. Project Nemesis: a secret government project by the very agency for which Franks works to make thirteen more—just like Franks. Now all bets are off, and the powers of evil are about to learn that it’s best to stay on a monster’s good side. Particularly if that monster happens to be an undying killing machine. Get Monster Hunter Nemesis here. Carrera—warrior, killer, and savior of humanity’s freedom—has driven the Tauran Union from his adopted country. But that’s not enough. To finish his enemies once and for all, he needs to draw them in for a final, crushing defeat. To get to Carrera, his enemies will have to take the strongest island fortress on two worlds. And in the process they’ll learn why the expression "blood stained water" is not just a literary allusion. 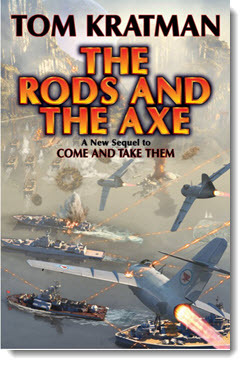 Get The Rod and the Axe here. Creating the Look of Monster Hunter International and More! Cover artist Alan Pollack chats with Baen about creating eye-catching book covers, how he came to be a professional artist, and why Larry Correia’s books are so much fun to illustrate. Meet Agent Franks of the U.S. Monster Control Bureau, one monster you most definitely want on your side. When Franks is injured (or simply when it’s time for an upgrade), he swaps out the old body part for the new. Consider current celebrities and/or historic figures. Now tell us three who would make Franks even more bad***, er effective, than he already is? 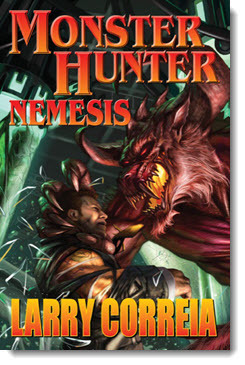 Send us your list and why and win a free signed hardcover of Monster Hunter Nemesis. Carrera—warrior, killer, and savior of humanity’s freedom—has driven the Tauran Union from his adopted country. But that’s not enough. To finish his enemies once and for all, he needs to draw them back for a final, crushing defeat. Special operations officer Jason Thanou of the Temporal Regulatory Authority must travel back to the final days of the American Civil War. Human freedom is on the line, and the leader of a slave underground possesses an incredible secret that may change Jason’s fate—and that of the future itself—forever. Rosalind Hawkins must uncover her mysterious employer’s dark secret and help him reverse the effects of a misfired spell. The Empire of Man has fallen and a new Dark Age is upon the stars. But one battle computer has survived the Collapse and is determined to find leaders who can return a star-faring republic to the galaxy. Includes The Sword and The Chosen. Are you prepared for the zombie apocalypse? The Smith family is, with the help of a few Marines. The plan is to find a safe haven from the anarchy of infected humanity. But what they soon discover is that the only way to save humanity is to fight back. Cobras: technologically enhanced warriors bred to fight an alien menace no ordinary human can withstand. Now Cobra Merrick Broom is on a secret rescue mission to a world of humans enslaved by alien Troft masters. 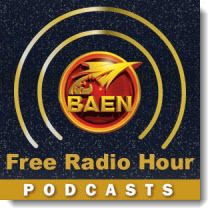 Don't forget to check out the newest ebook releases here, plus Baen.com free fiction from Steve White here. Also, don’t miss the first part of Tedd Robert’s non-fiction essay, “Why Science is Never Settled” here. 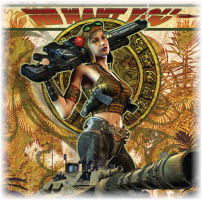 And check out the winning stories of the Jim Baen Memorial Award here and here.